This page is now a little defunct as I have finished my university education. 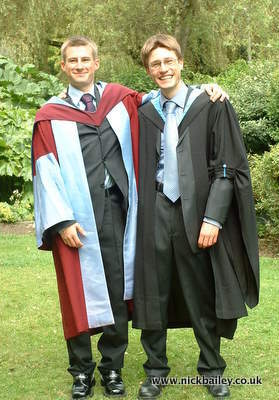 In 2004 I graduated with honours (doesn't everybody?) and a first class masters degree in Aerospace Engineering. 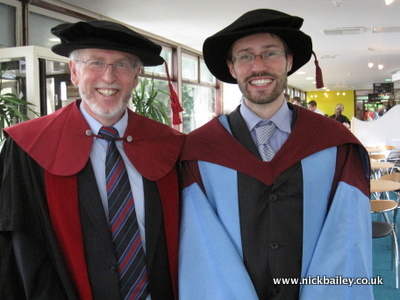 Here is a photo from that happy day (one of the best days actually - partly thanks to a certain Hogwartine excitement). Following my graduation and a long adventure to China I returned to Southampton and continued with my studies by embarking on a PhD. This was an awesome project to build a global asteroid impact simulator from scratch in C++. I was able to present my results at four international conferences, inclduing the IAU general assembly where Pluto was downgraded from Planet to Minor Body. 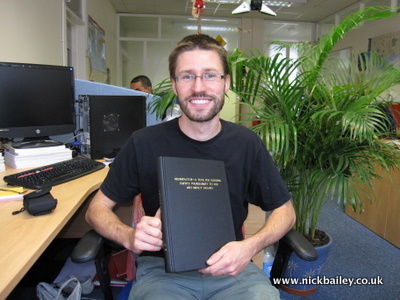 After four years my Thesis was finished and I passed my Viva in 2009 and graduated again. After 11 years in Southampton I am finally about to move on. I'm heading with my wife to Cambridge to continue work. I've had a great time here, an amazing third of my life (yikes), and made some great friends that I hope will be lifelong (thanks to Facebook). And the best think of all is that I met my wife here, so it will always have a special place in my heart. In all other ways, however, Southampton is a bit of a dive and I will be very glad to move on. Naturally the least dumpy of all has been my home of seven years in Kitchener Road. Kitchener, with it's community and awesome garden is simply the bestest bit of the whole city. It will be a real wrench to leave it behind - so many very happy memories, so many happy fires, so many of them really very massive ;). So it will be a fond farewell to the Kitchener Community, but a less fond farewell to the city of Southampton.